This weizenbock pours a cloudy marigold color with gold highlights. It pours with an off-white head that quickly fades to a practically non-existent film. A few bubbles are present, however. Wow, there are a lot of things going on in the nose of this beer. I picked up wheat, corn, flowers, citrus and pepper notes. This is a very fragrant beer! Hopfen-Weisse takes like a citrus soda, but with corn and wheat taking the place of the carbonation. There is an odd, but fantastic flavor path that this beer takes when you’re drinking: corn –> wheat –> lemon –> spice. There is a zesty effervescence about this beer. Hops become more apparent as it warms. Hopfen-Weisse essentially tastes like a wheat beer meets a saison meets a pale ale. Mouthfeel is light to medium, with a noticeable cloudiness. It clings to your mouth, but thankfully doesn’t dry it out. Hopfen-Weisse goes down smooth and is quite refreshing. This is a fantastic beer! I love finding beers/brewers that blur lines and test the boundaries of styles. 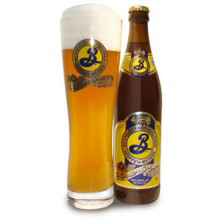 I hope to someday try the Brooklyn Brewery version of this beer.